Here is my report on this very friendly event. It is sure that it is not from me that you will learn a lot on Californian wines. It is more a text of my impressions on a very interesting discovery. I arrive by air in Los Angeles airport. The sky is cloudy. It is colder than in San Francisco. The hotel Shutters on the beach in Santa Monica is very well situated. From my room I see a crowd of people on rollers, on bikes, on various machines helping to slide rather than walking. Looking at the large beach and the sea, I try to see some Pamela Anderson that I would save from dangerous waves, but the sea is desperately calm and no Pamela’s are in the horizon. After a necessary sleep, the breakfast that I take in front of the sea is the image of Californian luxury. Surfers arrive to learn how to surf on a completely calm sea. In front of my eyes I see a pelican flying. I had no wine last dinner, so it must be a real one. Ron had convinced me to accept his invitation and he takes me in the hotel and drives me to see the hills of Hollywood, and to try to find the best views on this immense territory. We stop by Pinot Bistro, nicely welcomed by a charming and intelligent waitress. Ron had two wines. A Chardonnay Konsgaard Napa Valley 2002. It is highly alcoholic, and the word which comes to my mind is : intelligent. It means that there is a good balance between all its components: fruit, alcohol, length, and so on. The Cabernet Sauvignon Dunn Vineyard 1982 is very pleasant. The alcohol is strong too, and the black fruits are insistent. But age has helped this wine to get elegance. I eat mussels and a white fish. The waitress appreciates our wines. Everything was sympathetic. Ron is a wine lover. He does not like old wines, which is quite normal, and is an aficionado of Parker’s notations. He is a hundred points’ hunter. What I say concerning old wines will never influence him, but he welcomed my words with the genuine welcoming attitude of American people. Ron drives me to Bel Air, by the house of Jeff, the man who will organise the dinner of tonight. Jeff has a wonderfully decorated house, with very modern paintings that I appreciate a lot. There is style, modernism, and sense of beauty. In his garden behind a group of trees behind the pool, three plastic cows are looking at us. I love that. The cellar at home is only a part of his collection, but consists nearly uniquely of immense wines. My English is desperately bad. I ask Jeff : shall we have the dinner by your home? He answers yes. So I open the Pétrus 1959 that I have brought. I see Jeff double decanting young wines and he puts corks on them. I ask him why ? And he answers to me : it is better to have corks if we drive to the restaurant. So, I had truly bad English spoken as I was obliged to recork my wine for the travel. Jeff drives his speedy car with a very masculine way, so I grab my bottle with nervousness, reacting by every curve or stone on the road, handling carefully my wine. We arrive by “the wine merchant” in Beverly Hills where Alfred Tesseron of Pontet-Canet presents his recent wines. I knew him as we talked together on a Pontet-Canet 1870 that I had adored. I talked to the owner of the store, who has exposed a double magnum of Mouton 1929 for the tiny price of 500,000 dollars. I look at the prices of the Petrus which are shown, just to imagine what represents the Petrus 1959 for the rich customers of this store who live in such a surrounding. We arrive by restaurant La Terza in a very convenient separate room where many bottles are already opened. I see many recent years, and I realise that Jeff has taken the same idea as what happened by the dinner in San Francisco. It is my fault to not have asked any question. But as the wines were truly interesting, I am very happy with what happened. The Italian restaurant made a very convenient cook, very adapted to the wines. The service of the wines was absolutely excellent, the man in charge understanding immediately how to behave. The menu : pizza fritta with tomato and mozarella, grilled orange rosemary shrimp / lobster with string beans and bottarga / risotto with parmegiano-reggiano and fava beans / garganelli pasta with mixed mushrooms / yukon gold potato ravioli with beef ragout / rotisserie duck with seared snow peas and brandied dried figs / pan seared veal rack with fresh sauteed mixed vegetables / sliced rib eye steak with spinach / assorted Italian cheeses with chestnut honey and walnut bread / brown butter pistachio cake with blackberry compote and chef’s choice ice cream. The Ridge Riesling 1969 is highly maderised. So, as Jeff does not understand why people would care for old wines, he has the evidence of his opinion immediately with the first wine. With the shrimps, the wine becomes largely better, even if of no real interest. The Marcassin Chardonnay 2001 is a nice example of an elegant and successful Chardonnay. I like this style. The Chardonnay Aubert Reuling 2004 pleases more to the American attendance than to me. The Petrus 1959 comes as the first of all reds. The wine is incredibly complex, direct, noble. Since the first sip, it is a very comfortable greatness, more easily to understand than many other Petrus. I love this great Bordeaux with multiple levels of pleasure, charming, expressive, passionate. It is more sensual than the Petrus 1947 that I had drunk some days before. We have then different flights. The Harlan Estate 1999 pleases me enormously. As we are with young wines, I am friend to this one. Its fruit is natural. Others please me less, Bryant Family 1999, Foley Claret 1999 which is agreeable, and Colgin 1999. On a delicious ravioli, we have had according to my ranking : Schrader RBS 2001 acceptable, the Shafer Hillside Select 2001 possible and the Abreu 2001 and Araujo 2001 which are too hard to understand for me. In the next flight, the Peter Michael les Pavots 2002 was convenient, but the Colgin IX Estate 2002 does not belong to my taste. Then, some older ones are coming. I have appreciated the Araujo 1995. The Heitz Martha’s 1985 is corked, the Ridge Montebello 1984 is interesting. In the next group, the Mayacamas 1974 immediately pleases me as the best. The Montelena Estate 1978 was second, but when the course was served, I have changed the ranking. I did not like Clos du Val 1978 and Jordan 1978. The famous Stags Leap Cask 23 of 1974 put on the list did not come, which is sad. The Heitz 1966 is magnificent and first of its group, followed by Inglenook 1966 very good and Beaulieu BV Reserve 1966. The Charles Krug 1966 is more uncertain. The dessert wine, a Sine Qua Non Strawman 2002 is much too sugared for me. There had been a discussion before the dinner about putting the younger wines before or after the older. I am rather happy to have finished by very interesting old wines, which have proved, once again, that they can age elegantly. 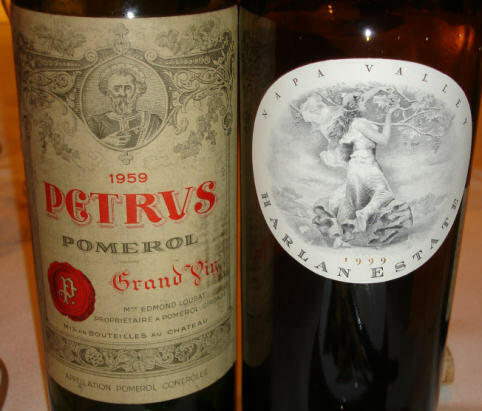 I was a little sad that my Petrus was alone in its type of taste, because I would have liked to compare it. But I am happy to have experienced some nice “old” wines of California. Petrus 1959 as first, then Montelena Estate 1978, the Mayacamas 1974, the Harlan Estate 1999 for the intelligence of its youth, and the Araujo 1995 that I found very good. This tasting was like a blind tasting for me as the names of the wines have no weight in my knowledge. So I have probably misjudged some great wines. Do not blame me on that. Jeff has a natural authority, knows how to organise nice events. His friends are very knowledgeable when wine is concerned. They talked about subjects on which my attention was not always easy. This immersion in the world of Jeff was convincing. Cette entrée a été publiée dans dîners ou repas privés le 4 mai 2006 par François Audouze.